Colnago is a manufacturer of road racing bicycles founded by Ernesto Colnago in 1954 in Cambiago, Italy. In 1960, Colnago first saw fame as Luigi Arienti rode to a gold medal at the Rome Olympics on a Colnago bicycle. From the late 1960s through the 1970s, Colnago was generally regarded as one of the builders of the world's best custom road race frames. In the mid 1970s, Colnago began using their current cloverleaf logo. In the late 1970s, some lower end models were produced, using heavier steel than the high end bikes. Since the 1980s, Colnago has continued to produce high-end steel bikes, and has branched out into other materials, working with Ferrari to develop new carbon fiber technology, and occasionally introducing titanium and aluminum frames. Its recent flagship frames, such as the C-40 and the C-50 — respectively named for Colnago's 40th and 50th birthdays— are lugged carbon frames with carbon lugs manufactured by ATR and IPA. Colnago has pioneered several design features, such as using smaller-dimensioned frames, the use of carbon lugs, its B-Stay construction for seat stays, and its HP-chain stay design for carbon frames. It is said that Ernesto Colnago dislikes the use of aluminum as a frame material, preferring either carbon fiber or steel. Colnago has sponsored at least one, often several, professinal team every year since the 1970s. In the 1970's, Colnago sponsored the Molteni team, which included Eddy Merckx. Colnago was well-known as the sponsor of the Mapei Professional Cycling Team throughout the 1990's. 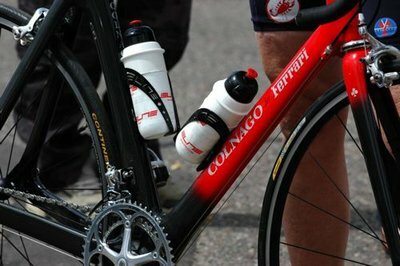 For 2005, Colnago sponsored the professional cycling team Rabobank. For 2006, Team Milram joined their list of professionally sponsored teams featuring well-known Alessandro Petacchi and Erik Zabel. In addition, Colnago serves as a co-title sponsor of the Landbouwkrediet-Colnago professional cycling team that competes on the UCI Europe Tour. In recent years, Colnago has successfully cultivated its image as the world's leading racing bicycle frame maker, stressing its Italian heritage and eye-catching, hand-painted, artwork lavished on its frames. This is in contrast to the recent outsourcing of production to the far east by other bicycle companies; Colnago previously stated that "Colnago has one production line only, and therefore, the bicycles of top professionals and normal users are produced together, by the same personnel with identical criteria". Until 2005, Colnago produced their entire frameset range in their Cambiago, Italy factory. However, for 2006, Colnago are now sourcing through both IPA IPAand ATR ATR Group Materiali Compositi Avanzati and , for entry level aluminum models, Giant Bicycles of Taiwan. This outsourcing was a move which Ernesto Colnago claimed "wouldn't ever occur," but eventuated after Colnago was announced to be in the process of registering to the "A-Team", a joint collobarative effort between Far East manufacturers to promote Taiwanese bicycle production. "For the 2006 model year, Colnago will be sourcing two entry-level aluminum road bike models from Giant, made to Colnago's spec and frame geometry and for sales in Europe and Asia only. All other Colnago bicycles are assembeld in Italy. No Colnago carbon fiber frames are made at Giant and none will be, as Mr. Colnago has a long-term sourcing agreement in place with ATR for carbon fiber bicycle frames." Master X Light — steel, Colnago's lightest ever steel frame was in production line from 2000-2004, deleted in 2005, and returned in 2006. Super (1970s and 1980s) steel tubing. Columbus SL and SP tubesets. Mexico (1970s and 1980s) Columbus steel tubing, with indents along tubes on main triangle. Masterlight; steel with indented tubes for main triangle. Master Extra-light; visually similar to Masterlight. Production discontinued for a short time (2004? ), perhaps in an attempt to move customer base to carbon or carbon/steel or carbon/alu framesets, it was re-introduced due to customer demand for an all-steel Colnago that was not a low-end afterthought. It is a bit lighter than its predesessor.